Successfully Added CUBE iWork8 Air Dual-OS Tablet PC - Licensed Windows 10 And Android 5.1, HDMI-Out, OTG, 3D Game Support, Quad-Core CPU, 2GB RAM to your Shopping Cart. Meet the CUBE iWork8 Air tablet PC, a beautiful 8-Inch tablet that features both an Android and licensed Windows 10 operating system – allowing you to take the absolute most out of this Dual-OS tablet while enjoying the best of both systems. For all Android enthusiasts out there, this beautiful Chinese tablet features an Android 5.1 OS that comes packed with all the trusted features Android users are familiar with. For those of you who prefer Windows, this tablet PC additionally features a secondary Windows 10 operating system that allows you to enjoy the latest Windows features and programs from the palm of your hand. By allowing you to switch in between two great operating systems, the CUBE iWork8 Air tablet PC offers a stunning user experience that surely allows you to take the most out of this remarkable device. Packing a beautiful 8-Inch display that features a stunning 1920x1200p resolution, the CUBE iWork8 Air tablet allows you to enjoy all your media and games in stunning detail and vivid color. In order to increase your media experience even further, this two in one Windows / Android tablet has been equipped with a powerful Intel HD Graphic card that supports extreme high resolutions and detail – allowing you to enjoy the most graphically demanding games and videos in absolute stunning beauty. Added to that, the CUBE iWork8 Air Tablet PC furthermore supports 3D gameplay – truly turning this Dual-OS tablet computer into a state of the art mobile gaming device. Download the latest games and media through Google Play or enjoy the most demanding browser games online – with this Android / Windows tablet at hand, your mobile entertainment options will truly be limitless. Increasing your overall user experience even further are the tablet’s OTG support and HDMI-out port. Not only does the CUBE iWork8 Air allow you to connect external hardware devices such as game controllers, keyboards, and memory pens to this beautiful 8-Inch tablet – it furthermore lets you connect it to your TV or PC monitor, allowing you to enjoy all the magnificent features this tablet has to offer on a larger screen. 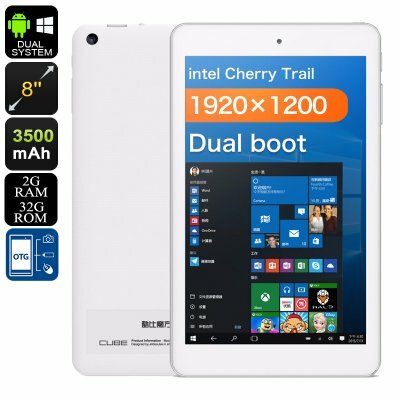 Featuring a powerful Quad-Core Intel Atom Cherry Trail CPU that has been clocked at 1.44GHz, this tablet computer is guaranteed to handle whatever you throw at it with ease. Along with its 2GB of RAM, you will be able to engage in demanding multitasking sessions, play the latest games, and watch FHD movies without dropping a frame. With 32GB of internal memory available and the added possibility to insert and additional 64GB externally, the CUBE iWork8 Air tablet is guaranteed to offer enough storage for all your media, games, and files alike – ensuring that with this tablet PC at hand, there will never again be a single moment of boredom in your life. With its epic 2500mAh battery, this Windows / Android tablet provides you with enough power to get through the most demanding of days without you ever needing to worry about running out of juice. Browse the web for hours in a row, watch numerous FHD movies from beginning to end, or enjoy a day packed with mobile game play or online video calls – nothing is too much for this powerful 8-Inch tablet PC. The CUBE iWork8 Air tablet PC comes with a 12 months warranty, brought to you by the leader in electronic devices as well as wholesale electronic gadgets..
Arabic: - 8 بوصة الكمبيوتر اللوحي - Chinese Simplified: - 8 英寸平板电脑 - Czech: - 8palcový Tablet PC - Dutch: - 8-inch Tablet PC - French: - 8 pouces Tablet PC - German: - 8-Zoll-Tablet PC - Hebrew: - 8 אינץ Tablet PC - Hindi: - 8-इंच टैबलेट पीसी - Hungarian: - 8-lassan mászik Tabletta PC - Italian: - 8 pollici Tablet PC - Japanese: - 8 インチ タブレット PC - Korean: - 8 인치 태블릿 PC - Malay: - 8-inch Tablet PC - Norwegian Bokmål: - 8-tommers Tablet PC - Romanian: - 8-inch Tablet PC - Russian: - 8-дюймовый планшетный ПК - Spanish: - 8-pulgadas de Tablet PC - Thai: - 8 นิ้วแท็บเล็ตพีซี - Turkish: - 8-inç Tablet PC - Vietnamese: - 8-inch máy tính bảng.